Described as "the book auction event of the year", a sale today (December 7) at Sotheby's will see the world's most expensive book go under the hammer. 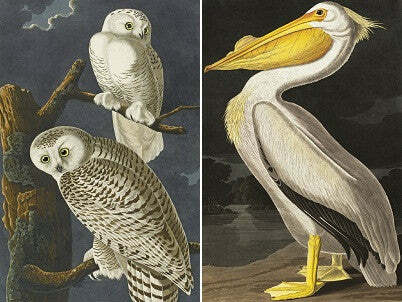 John James Audubon's 'Birds of America' was written as he travelled across America over a period of 12 years between 1827 and 1838. It's a comprehensive ornithological study featuring 435 hand-coloured engraved plates, based on Audubon's original watercolours. Once the book was completed he journeyed back to England, where it was printed and targeted specifically at wealthy patrons. Only 119 copies of the book are known to exist, 108 of them kept by libraries and museums with the rest privately-owned, and in 2000 it broke the World Record price for a book when it sold for $8.8m. The copy on sale today has an incredible estimated value of $6.5m - $9.5m. Today's highly anticipated sale will see collectors from across the globe bidding for the prize. And with the rise of the BRIC nations, the changes the collectors markets have seen over the last ten years and the growth of the rare book market, experts expect the book to break its own record price at the auction. The sale will also feature an incredibly rare copy of Shakespeare's First Folio, described as "the most important book in all of English literature" and valued at $2.3m, along with an amazing collection of other fine manuscripts, rare books and drawings. Click here for all the auction news and results once they're in.